Join Our Giving Tree Family Today! 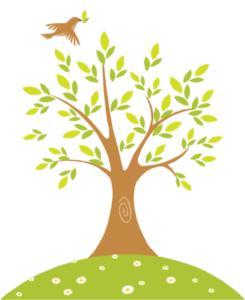 Honor or remember someone special by adding a leaf to the Nashville Ronald McDonald House Giving Tree. For a donation of $250.00 or more, you can honor or remember a loved one with a gold leaf engraved with your loved one’s name that will be placed on our Giving Tree. The hand-painted Giving Tree is located in the dining area of our House, and is an ever-present tribute. The funds provided by your tax-deductible donation will enable us to continue serving families of critically ill children by providing a “home away from home”. Imagine the Impact Your Gift Can Make in the Life of a Family. To make your donation, visit rmhcnashville.com/donate/ or make your check payable to Ronald McDonald House Charities of Nashville and mail to: Ronald McDonald House Charities of Nashville 2144 Fairfax Avenue Nashville, TN 37212 If mailing a check, please include the following information: Donor Information Name________________________ Email________________________ Address_______________________ City__________________________ State________Zip______________ Phone________________________ Giving Tree Engraving Please print the name as it is to appear on the Giving Tree leaf, with a maximum of 32 characters. _____________________________ _____________________________ _____________________________ Please send an acknowledgment to the family, loved one or recipient of this donation to: Name________________________________ Address______________________________ City_________________________________ State__________________Zip___________ This donation was made in ___ Honor ___ Memory.